In this article, We will learn how to develop Spring boot Rest Service with MongoDB. MongoDB is a popular NoSQL database and widely used database for newly started applications. In this example, We have used Spring Data to perform the operations with the MongoDB database. We have explained here CRUD (Create, Read, Update and Delete) operations with JSON Rest Service and used MongoDB database. NOTE: Make sure that MongoDB server is running, By default it will run on 27017 port. @EnableMongoRepositories : It will enable MongoDB repository and we have provided based package here so it will be considered as a repository based package. It normal interface which contains CRUD methods. * Created by JavaDeveloperZone on 04-04-2018. Service Implementation where actually business logic has been written. @Service indicate service layer. We have Autowire EmployeeRepository using that we can communicate with MongoDB database. * Created by Java Developer Zone on 04-04-2018. Here we just define method name, Spring data will automcatilly create query using method name. Here is more details for the same. @Document indicates the MongoDB document. @Id indicate the primary key, It will not allow duplicate value. When the data type is String at that time it will automatically generate random Id. 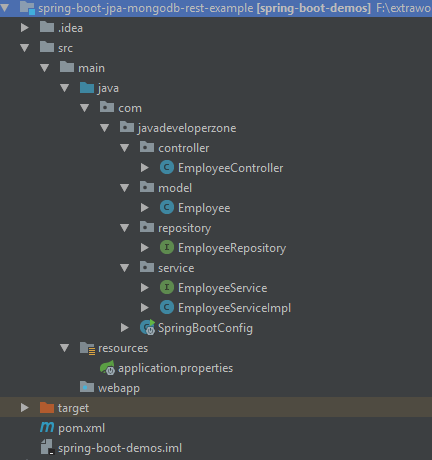 We have learned about the way to develop JSON Rest Service with MongoDB database and also learned insert, update and delete operations with MongoDB in the content of Spring boot application.